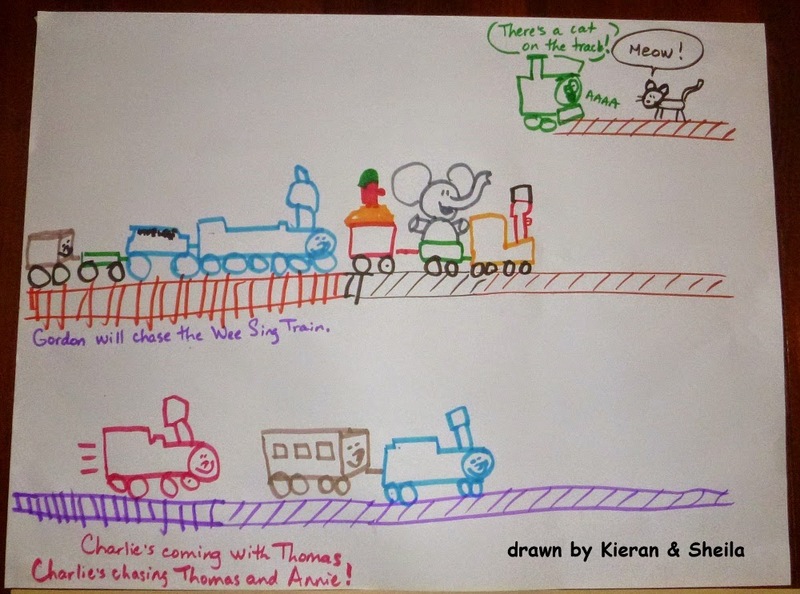 Drawing can be a useful tool for developing communication skills in young children, and in older children (and teens and adults) with communication delays. Today I want to share with you some interesting developments from one of my young friends on the autism spectrum. Kieran is a bright active young boy (in grade 4) with delays in the development of his verbal language. He is very visual and is a whiz at math and putting together complicated building toys using diagram instructions. For the past two years, his family and I have been drawing things for him, making visual representations of what happens in our toy play and also of situations and interactions from the larger world around him. During our early sessions, he was happy to have others do the drawing. The drawing was a good anchor for our conversations during play and this helped his focus, his comprehension and his verbal language development. Following our drawing/play sessions he liked to have the big drawings posted on the walls at home so he could look at them, think about them and talk about them with his family. Then, at the beginning of this calendar year, Kieran started to take a more active role in the drawing process. "I want to go to Monster University"
He has begun to draw collaboratively, adding details and figures to our large drawings (that we do beside our toy play), so now those drawings include his direct visual thoughts as well as his play ideas and what he has verbally directed me to add. What are the benefits of going after communication in this context? First and foremost, it's fun and relaxed, and it makes formidably difficult skills (communication and social interaction) more approachable and accessible. Second, it stimulates communication development in a very natural context, so the language learned is already generalized to where it's functional and fits. Third, it lets the individual (who is the target of the therapy) set the pace - you can be certain that the information is going in, and they will show you when they have enough information and confidence to give the new skills a try. Because we have never forced the issue, Kieran continues to willingly taking steps forward, trying new things and gaining confidence daily. 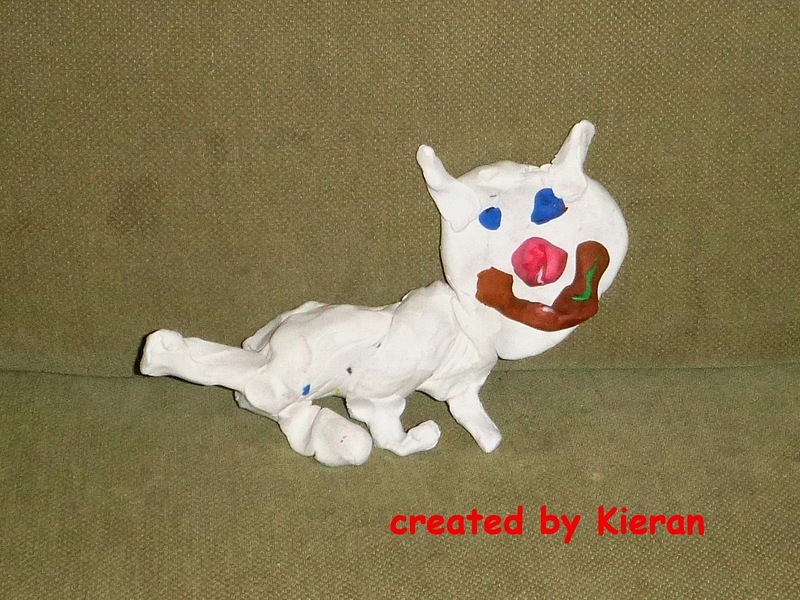 I leave you with his latest creation, a plasticine cat modeled after the many little plasticine animals I have made for him during our play over the last year - as you can see, it's a great cat with lots of personality and a happy disposition ... just like the young artist who made it.